"I'm tired of words," surmised Lindsay Peat when faced with questions pertaining to the current state of women's sport in Ireland, "I want action." A sensational all-rounder who has represented Ireland in soccer, basketball and rugby union, Peat is left disheartened by the current state the latter-most of these sports finds itself in, and the manner in which women's rugby has seemingly gone backward while international rivals have progressed. "We're saying the right things," Peat stated in conversation with OTB AM, "but now we need to start doing the right things." "We can't try to compete with England and France unless we get money behind us. "We need to put those frameworks in place whereby our players can train professionally or semi-professionally to try and match those standard-bearers in the game such as England, France, USA, Canada or New Zealand. "They're all going play in the summer, like look how many games they're getting at an international level. "They don't have to wait until a Six Nations to see how we go." Winners of the Six Nations in 2013 and 2015, Ireland's women slumped to four defeats from five games earlier this year; disappointing defeats to Wales and Italy coming alongside two heavy defeats to England and France. The question of professionalism ultimately makes the plight of Irish women extremely difficult. "The goals and the words are fabulous," Peat explained, "but you need stepping-stones, and stepping-stones toward actions." "It didn't just happen overnight, if we look at the Tyrrells Premiership [in England]. "Yes there was uproar about taking back the professional contracts, but they invested it back into the club game because they felt it was better spent there. "They've obviously introduced the contracts again [subsequently]." 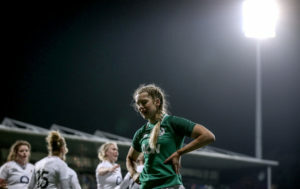 While Lindsay Peat believes Irish women's rugby ultimately needs the advantages a wealthy benefactor or sponsor could generate, she does crucially acknowledge that if in the position of a younger player, she knows what she'd be angling toward. "If I was 10-years younger and a club over there felt I was good enough," Peat revealed, "I would be gone." "You can't deny people that, you've got to push that." Pillar's message to Connolly: "Never look back with regrets."